Traditional resistive load cells are typically made from strain gauges arranged in a balanced wheatstone bridge configuration. When a voltage is applied to them and a strain is induced due to an applied load, they typically output a millivolt signal proportional to the strain felt by them. This signal is represented as a mV/V number i.e. if a 10 V DC power supplyis applied, a 20 mV total change in signal can be seen in response to applied loads. A user would need a signal conditioner to condition this signal, a data acquisition system to digitize the signal and application software to view and process the signal! Loadstar Sensors offers you a much more elegant and simpler solution! Our iLoad Digital load cells based on a capacitive sensing technology. 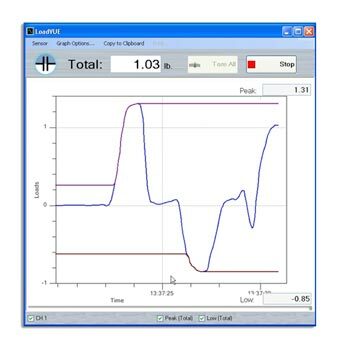 converts a load into a reading on a PC or a microcontroller without need for any additional signal conditioners, data acquisition systems or special software. 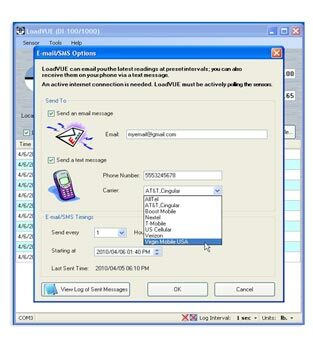 Connect a iLoad Digital load cell to your PC's USB port and start measuring. Alternatively, our DI-100U or DI-1000U load cell interfaces offers a similar digital output for resistive load cells to connect to a PC via std USB port. The USB port itself provides the power needed to operate the system without need for any external power source. Our DI-1000ZP wireless load cell interface enables a resistive load cell to connect to a PC via std. IEEE 802.15.4 wireless protocol. The unit can be powered from a wall adapter or run on the internal rechargeable battery for truly cordless operation. This simplicity of use is what we refer to as "Plug and Sense Simplicity". This technology enables end users without any knowledge of load cells to start measuring forces and loads within minutes. It enables software developers to build great new applications that incorporate force and load measurement. You don't need to be an electronics engineer to use one! 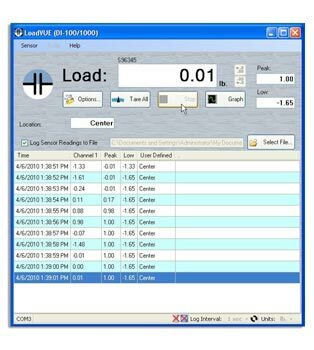 The optional LoadVUE load cell software can provide an elegant interface to make it even more convenient to measure loads, and to log the data to a comma separated text file that can be easily opened using Microsoft Excel, Matlab or other statistical analysis packages. Our iLoad Analog load cells convert a load into a signal in the 0-5 VDC range. These load cells are ideal for applications that need to input signal directly into an existing PLC/DAQ - there is no need for a signal conditioner or linearizer. Our load cells output a linear signal: 0.5 V at No Load and 4.5 V at Full Load, to make it easy to incorporate our load cells into your custom applications.